Gale force winds literally pushed Steve Williams and his 110 lb. 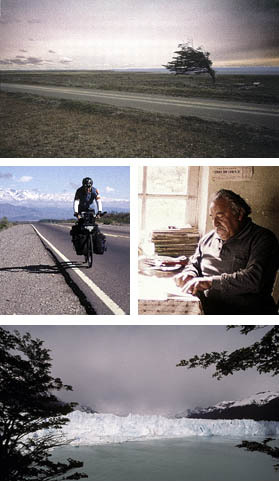 bicycle off the road as he bicycled across Argentina’s Patagonia on his way to the tip of South America. 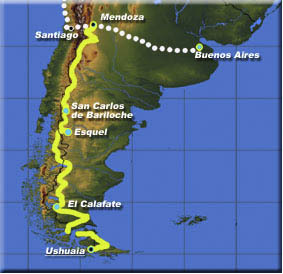 This 2,287-mile stage of the Six Continents Quest Bicycle Expedition, which was supported by a grant from the National Geographic Society, began in Mendoza, Argentina, where Steve had vowed 20 years before to return and cycle southward to the end of the world. Using dazzling images of the Andes, Patagonia and the Perrito Morreno Glacier, adventure public speaker Steve Williams takes audiences along on a roller coaster ride peopled with characters ranging from young parents concerned about the imminent collapse of their country’s economy to a grizzled rancher who had seen it all.